I don’t know about you, but I try to eat as gluten-free as possible in my day-to-day life. I don’t have Celiac disease, but I just feel better when there’s less gluten in my life. Do you know what I mean? I have friends who do this as well. They don’t eat 100% gluten-free, but when it’s a possibility to eat that way, whether at a restaurant or buying food at the grocery store, they do. I’m the same way. When I buy snacks, cereals, or anything else packaged, I look for a gluten-free label. That way, everyone wins. 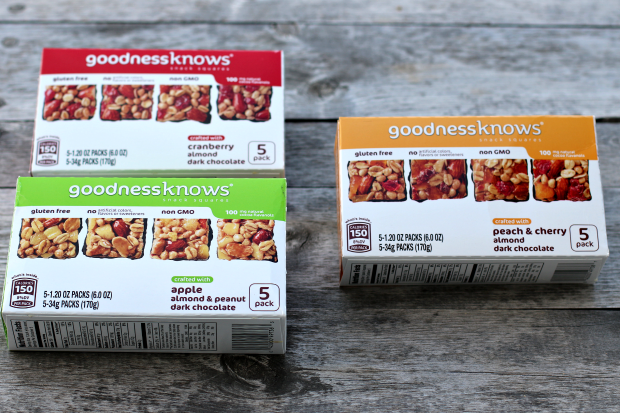 This year, I’ve been working with goodnessknows this year, and as a bonus, I’ve really enjoyed incorporating the goodnessknows snack squares into our snack bin in the pantry. They’re such a tasty little treat for after school and swim practice, I almost can’t keep them stocked. My son is a little bit obsessed with the apple, almond & peanut dark chocolate. He loves them so much I kind of have to hide them sometimes. 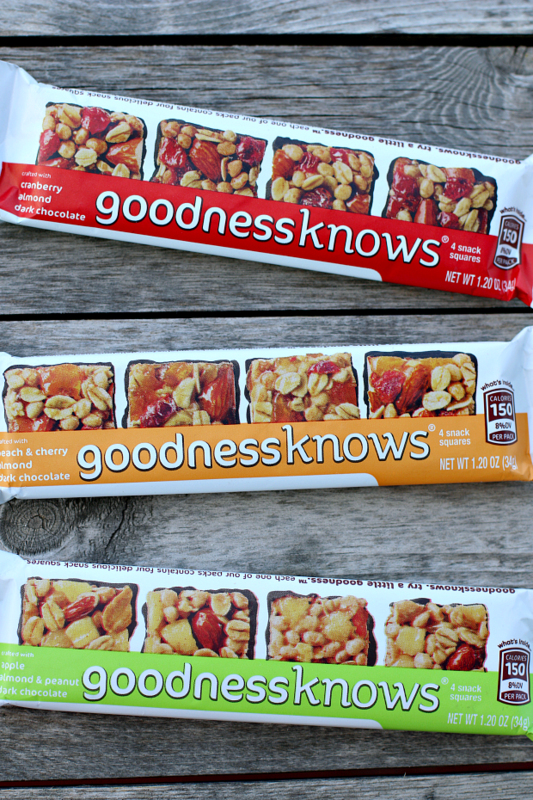 I’m a huge fan of the cranberry, almond, dark chocolate squares. You know when you’re craving just a little bit of chocolate? Maybe in the afternoon when your energy is starting to flag a little bit, but it’s not even close to dinnertime. Maybe you’re still stuck at the office and have a few hours of work before you can get home to eat dinner. This is such a delicious little snack to fill that craving. Stow it in your desk, your purse, your car, or your gym bag. The whole package of 4 squares is only 150 calories, or about 40 calories per square. Not too shabby for a little pick-me-up. Even this tiny amount of dark chocolate seems to satisfy that craving, without being overwhelming. 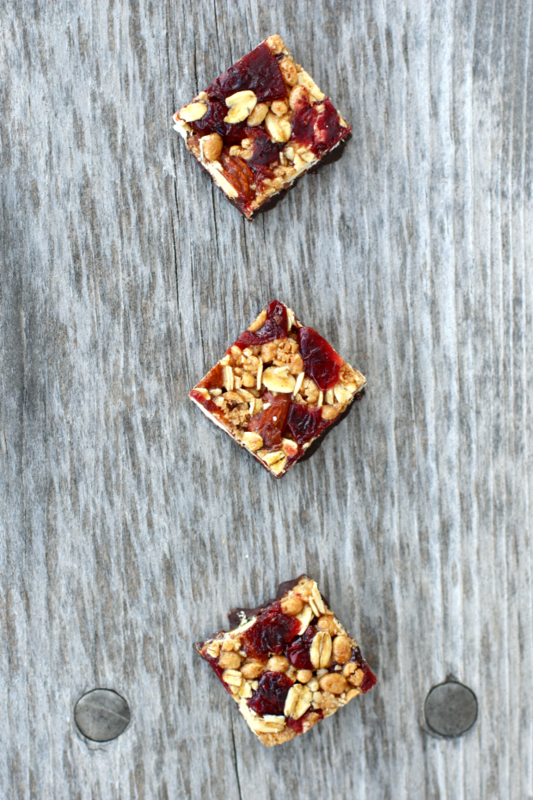 And I love that the snack squares are filled with good ingredients, like apples, cranberries, almonds, cherries and peaches. So yummy. They’re made without artificial colors or sweeteners and are gluten-free. All things I love. 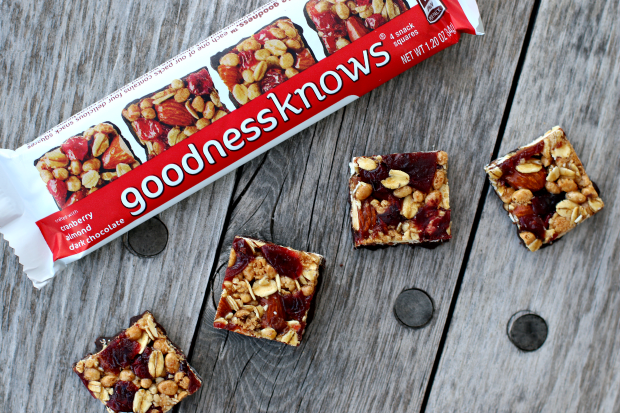 Well done, goodnessknows for making a delicious snack that’s gluten-free.